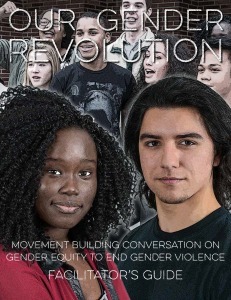 Our Gender Revolution uses conversations to explore concepts of gender, inequality, and gender violence and to engage young people as social change agents. The Our Gender Revolution Conversation Guide was designed for activists, advocates, teachers, and community members working to end gender based violence. Ideal for the classroom and/or community groups, the guide was created to help those who are interested in sparking social change to end gender based violence through conversations with high school students (ages 14-18). The Guide includes tips for facilitators on getting started, recruiting youth, community assessment and a vision for empowering youth to be movement leaders. The manual and materials can be ordered for delivery or downloaded from the website for free. Additional materials that support the campaign and raise awareness such as posters, pocket cards and brochures are also available for download or delivery.